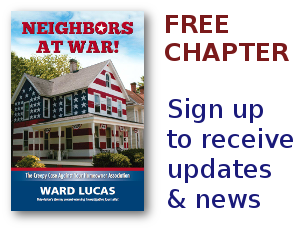 Russell Archives - Neighbors at War! How to ‘legally’ discriminate against children in HOAs…… It’s pretty simple, and it only takes one word! A Fair Housing case was just settled in Minnetonka, Minnesota. Six families in the Greenbrier Village Homeowners Association won a settlement agreement in a federal lawsuit. The feds say the HOA was violating the law when it banned children from playing in the grass. Disabled and living in an HOA? 6 Comments on Disabled and living in an HOA? Each day I’m alerted to scores of cases where folks living in HOAs are denied reasonable accommodations for their disabilities. Some of these HOA denials are blatant violations of the Fair Housing Act, while some are not. I’m going to compare two recent cases that have grabbed the attention of the media. While both sound like truly legitimate cases, one homeowner did it right, and the other homeowner technically did it wrong. Build it and they will come. The HOA that is! What do you do with a Naked Neighbor? 1 Comment on What do you do with a Naked Neighbor? While HOAs are usually the most disastrous organizations ever created, can they ever really be useful? Well the residents in the Cardinal Glenn Homeowners Association, in North Charlotte, NC are hoping their HOA will soon come to the rescue. Seems this HOA has a major issue with one of their kookie residents and can’t get any help from city leaders or the police. It seems that one of Cardinal Glenn’s residents likes to wear his birthday-suit while standing outside of his home talking on his cellphone. This, according to the neighbors.